IT'S a name synonymous with luxury, but it isn't until you actually step foot into the Hilton Sydney Hotel that you get a feel for a certain extravagance. As a busy professional in the big smoke for a few days, hopping from one meeting to the next, it was just as important for me to find the right hotel as it was to make the flight on time. However, the moment I walked into the Hilton Sydney I knew it was the right decision - an indulgence blended with the comfort a traveller seeks. It starts with friendly staff that greet you warmly, and an ambience that is more whisper than chatter. It is a marked contrast to the bustle of George Street beyond the modern, glassed-walled foyer. Nestled in the heart of Sydney, the Hilton is a five-minute walk from Hyde Park, a two-minute walk from the State Theatre and a casual stroll to the Sydney Opera House. Walking into the contemporary hotel suite, the large work stations with desk and ergonomic chair first garnered my attention. It was a utilitarian retreat that became my office during my time in Sydney. If more space was needed, there was the option to meet and do business in one of the hotel's 28 meeting and conference rooms. Then there was the Executive Lounge, which boasts a casual yet sophisticated atmosphere for both entertaining and quietly working away on the laptop, accompanied by complimentary breakfast, WiFi and appetisers. As the busy day drew to an end, it was time for a little down time and with the Hilton Sydney there was no point leaving the building. The hotel is home to Luke Mangan's renowned restaurant Glass brasserie, the stylish and award-winning Zeta Bar (Zeta Bar's terrace pictured right), and the iconic Marble Bar. For those with a penchant for a pampering, there is the LivingWell Premier Health Club and Day Spa. Heading back to my room, and a well-earned rest, the hotel suites didn't disappoint either, with the always-important black-out blinds promising an uninterrupted sleep. The shower facilities were also spacious. Without a doubt, the Hilton Sydney puts the guest first, catering for the corporate traveller or those looking for an escape. Notably, the hotel is the single most expensive property investment ever made by Hilton Worldwide after it underwent a complete renovation in 2005. Interestingly, Johnson Pilton Walker (JPW), the architects behind the Sydney Opera House makeover are also behind the design of the building. Interior designers Chhada Siembieda Australia (CSA) worked closely with JPW to maximise and accentuate the interior of the building's huge open spaces. 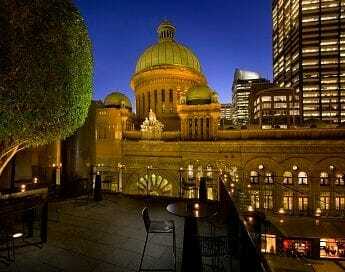 It had been a rediscovery of the Sydney Hilton, which has been part of the Sydney landscape for more than 40 years. But the reminiscence faded as the night closed in, and the lights went out on another hectic Sydney trip.